Looking back in human history, one can see that war is the quickest way a Tyrant can assert power to destroy democracy and rule as dictator. However, how does a nation recognize a Tyrant? Here are some famous quotes to consider. Timely quotes. Certain world leaders need to stop playing at ‘mine’s bigger than yours’. Timeless quotes! 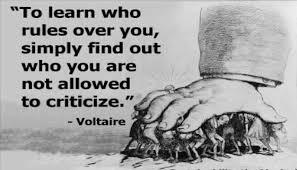 My favorite came from Voltaire, but each was was very powerful! Great post Karen! These are all such timely quotes that are worth being shared. I do not usually deal with politics in my blog, but the time is too dangerous, and democracy cannot survive without people speaking up. I am proud to reblog this post. He is going to start a third world war to deflect attention from his cracked character.